Athletes in Action is teaming up with the two coaches of this weekend's Superbowl to take advantage of this well publicized sporting event. The focus of this partnership between AIA, Coach Dungy and Coach Smith isn't the fact that the two coaches are friends, or the fact that one of them will be the first African-American coach to win the Superbowl. No, the focus of this partnership and the website: www.beyondtheultimate.org is the shared faith each coach has in Jesus Christ. 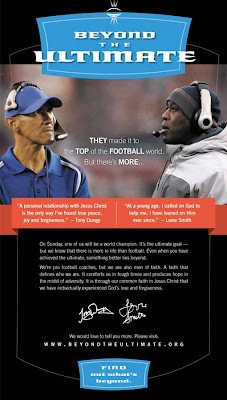 Both Tony Dungy and Lovie Smith profess faith in Christ and live lives of integrity and character on and off the field. Beyond the Ultimate is a tool to help share the gospel with those who might otherwise just be interested in a ball game. I wouldn't necessarily agree with the theological positions that seep through on all the pages of this website (a bit heavy on the helping of free will), but I trust that the Lord will be pleased to use this for His glory. Consider this - these two men will be more popular (in many eyes) than Jesus this Sunday, yet they're using they're popularity and publicity and platform to point people back to Him. This, IMHO, is what it means to be salt and light...what it mean to fulfill Colossians 3:17 by doing "whatever you do, in word or deed, do[ing] everything in the name of the Lord Jesus, giving thanks to God the Father through Him." You can listen to an interview Coach Dungy did with FamilyLife Today here.